Not much info on wikipedia this time, but here's a little video from the Korkeasaari zoo. I learned that the name "comb-rat" (in Finnish comb-toe-rat) comes from their back feet where they have bristles that they use to keep their fur in good shape... and they don't drink water at all, they survive on the juices they get from their veggie diet. 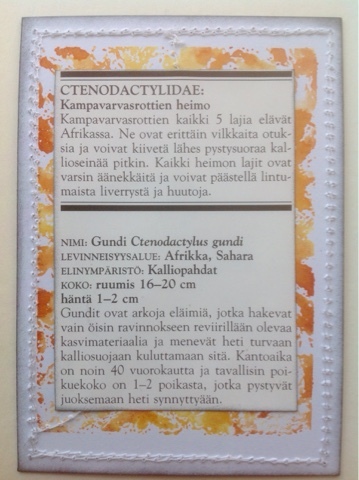 Here is the back of my card with the short description from the encyclopedia. It was so short, I added the comb-rats family description too. It says they are able to climb up vertical rocks and are noisy, producing almost songbird type whistles! Would you have guessed? When I saw the thumbnail I thought you had gone for Guinea pig or gerbil but a combat sounds far more interesting. I'm so in awe of your art. I always learn something new each time I visit you. This Gundi is amazing, too. Very unique G word and quite impressive art to accompany it. BTW, I love how you share your previous alphas. I may "borrow" that idea because it is quite clever. That's a cute creature! I do enjoy all the info you include! He's kinda cute for a rodent. You've given him a wonderful background. Being a sewer, I love the stitching detail on your card. Great word to choose. Never heard of a gundi but he does look cute! A gundi! That is a new word I have learned today. The background looks very desert-like and I really admire the stitching around the edge of your card. I tried that once and it really isn't easy to do. 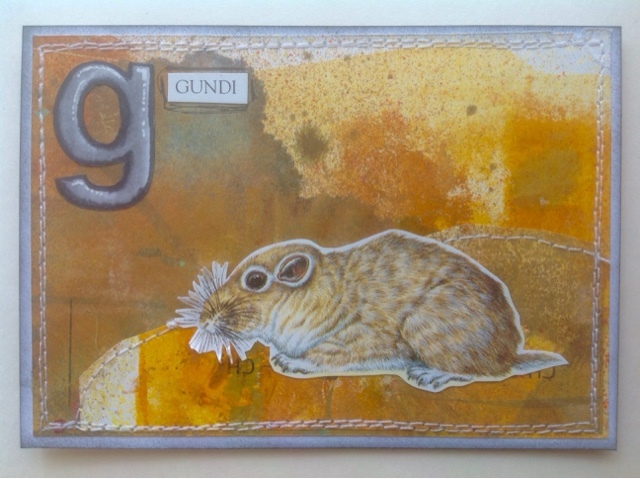 Gosh, I have never heard of a Gundi, and I love your card. The background sets the little rodent off really well. What a great word ...Gundi! Brilliant entry for The Craft Barn Challenge, thank you. This challenge is so educational. My wildlife knowledge is growing each fortnight. A lovely background for the gundi to sit on.